Chivalry is dead, they say. Well, menfolk, here are 23 Behaviors of a Gentleman that you should adopt (especially Number 21!!!). 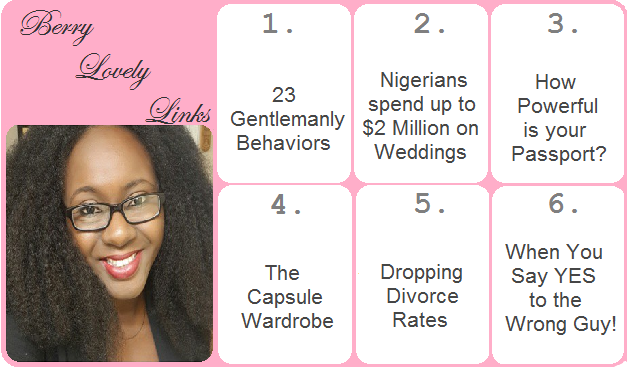 This is an old article but just in case, check out How Nigeria's Elite Spend Over $2 Million on their Dream Weddings. Another oldie but let's refresh our memory on How Powerful is your Passport? I only recently learned about the concept of the "Capsule Wardrobe," which is having only 37 items in your closet for each season (this is not for the fainthearted Nigerian). Learn how to build one here. Did you know that Divorce Rates are Actually Dropping? Maybe #5 is because 20% of engagements don't end up with a wedding. See What Happens When You Say Yes to the Wrong Guy. Thanks berry., I love, love, love this links.. I'm so bookmarking this blog. Thanks Berry, I look forward to this every week now! Well done, Berry! I enjoyed reading them.